NEW YORK— Scientists at the University of Southampton in the U.K. have found that Methicillin-resistant Staphylococcus aureus (MRSA) cannot survive on pure copper surfaces for more than 45 minutes. MRSA is an infectious bacterium that responds to only the strongest antibiotics and is a cause of often-fatal hospital infections in both the U.K. and the United States. 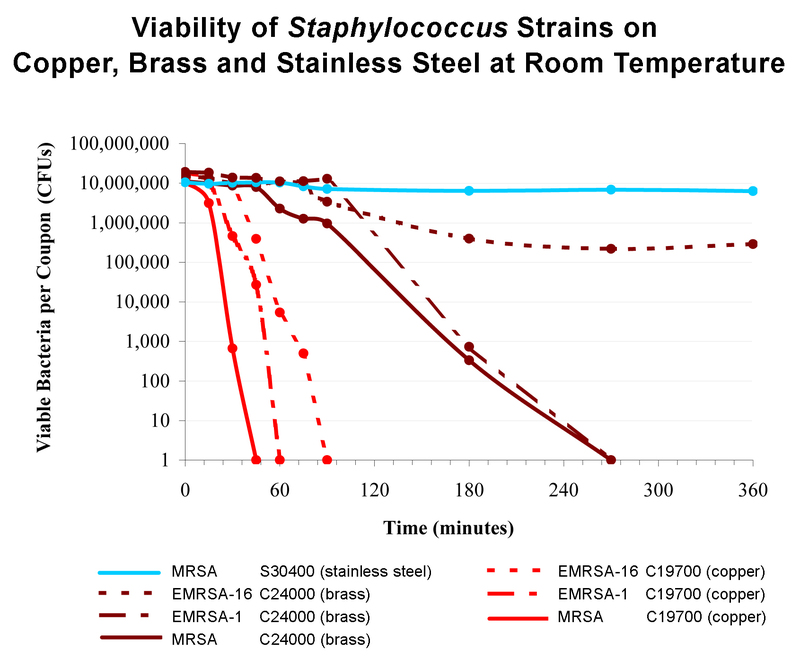 The study, published in the July 2006 issue of the Journal of Hospital Infection, assesses the ability of copper and brass to eradicate strains of MRSA compared with that of stainless steel, which is commonly used for work and touch surfaces in healthcare facilities. The U.S. Centers for Disease Control and Prevention (CDC) estimates that infections acquired in U.S. hospitals affect 2 million individuals every year, resulting in nearly 100,000 deaths annually and costing $5 billion. MRSA is an increasingly common source of hospital-acquired infection. The Southampton study compared survival rates of three strains of MRSA on pure copper, brass and stainless steel. Tests were conducted at room temperature (22 degrees C, 71.6 degrees F) and refrigeration temperature (4 degrees C, 39.2 degrees F). 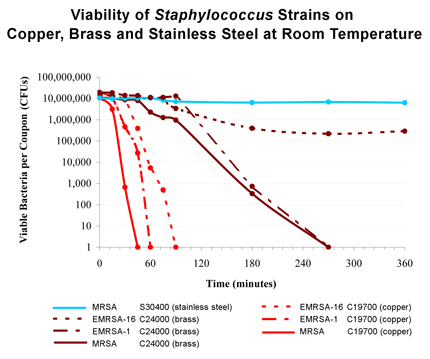 On pure copper MRSA, epidemic EMRSA-1 and EMRSA-16 were completely killed after 45, 60 and 90 minutes, respectively, at room temperature (see figure). On brass, which is 80 percent copper, all three strains were drastically reduced in three hours, and MRSA and EMRSA-1 were dead in 4.5 hours. The bacteria on the stainless steel surface remained viable after 3 days at room temperature. At refrigeration temperature, the three strains placed on the copper were dead within six hours. On the brass, the first two strains were drastically reduced in six hours. The stainless steel had no effect on the bacteria. According to Dr. C.W. Keevil, of the Environmental Healthcare Unit at the University of Southampton and lead author of the study, "Results for brass are significant with regard to reduction of the bacteria, although not quite to the extent as those for pure copper. It is clear, however, that the current use of stainless steel for hospital touch surfaces is not recommended." One of the primary methods of MRSA transmission is by healthcare workers who may go from one patient to another without washing their hands. The CDC has stated that hand hygiene is the single most effective strategy for preventing contamination. Dr. Harold Michels, a co-author of the study, observes that hand washing and regular disinfection regimens are not always adhered to and that common touch surfaces, such as door handles, push plates, IV poles, bed trays, equipment controls and the like, will remain reservoirs for contamination, unless the surfaces themselves are made to be antimicrobial. He said even routine disinfection leaves the potential for cross-contamination to occur during the period between disinfections; whereas, copper alloys are always at work. The studies were sponsored by the Copper Development Association in the USA and by the International Copper Association in the U.K. Dr. Michels of the CDA notes that the association recently concluded independent laboratory testing of five copper alloys on five different pathogens, including MRSA. These laboratory results have been presented to the U.S. Environmental Protection Agency as part of the process to obtain registration for public health claims under the Federal Insecticide, Fungicide and Rodenticide Act (FIFRA). The University of Southampton is one of the U.K.'s top 10 research universities, with a global reputation for excellence in both teaching and research.